The Harlem bakery provides job training and skills, while honoring culinary baking traditions from women around the world. The Hot Bread Kitchen storefront is an unlikely sight on 115th Street in East Harlem. It’s just a few blocks from New York City’s largest housing project and directly underneath the elevated tracks of the Metro North commuter train. Yet there it is, with floor-to-ceiling windows that tempt passersby with a display of baguettes, sourdough batards, sweet Mexican conchas, and mini bialys. This is no ordinary bakery, in large part thanks to its bakers. On a recent summer day, all of the people mixing and shaping fresh loaves at Hot Bread Kitchen were women. In an industry dominated by men, this demographic shift is intentional. Hot Bread Kitchen is geared toward “creating job training nationally and changing the face—and the gender—of the culinary industry,” says founder Jessamyn Rodríguez. The vast majority of Hot Bread Kitchen’s bakers are immigrants who brought with them recipes for things like naan, sweet tortillas, and Albanian burek. Hot Bread Kitchen is an organization that aims not only to produce and market unique ethnic breads; it also works to move unemployed immigrant women into well-paid jobs. Only 56 percent of immigrant women in the U.S. are employed, compared to 79 percent of immigrant men. Jie Zong, a researcher at the Migration Policy Institute, says lack of credentials or credential recognition, limited English skills, and traditional family structures that saddle women with childcare responsibilities can make it difficult for many of these women to find employment. When Rodríguez left her job as a policy analyst to found Hot Bread Kitchen, she set out to knock down those barriers one at a time. According to the Migration Policy Institute, nearly 200,000 unemployed immigrants in New York City are looking for work at any given point. And there aren’t enough job training programs to meet demand. “There is not much incentive for local governments or agencies to invest in these programs for immigrant women, and there isn’t a lot of federal funding available for these types of programs,” Zong says. Hot Bread Kitchen hopes to bridge a small piece of this gap by offering a nine-month program to 15 women at a time. The women learn how to bake and also cultivate other skills like kitchen math and science, basic English, and how to build a resumé and interview for a job. Hot Bread Kitchen also arranges its participants’ schedules around their busy lives when possible. Take Fanny Pérez, for example. She started at Hot Bread Kitchen as a trainee three years ago and has since been hired as a full-time staff member. Pérez works from 8:00 am to 4:00 pm every day, which allows her to drop her daughter off at school on the way to work and pick her up on the way home. 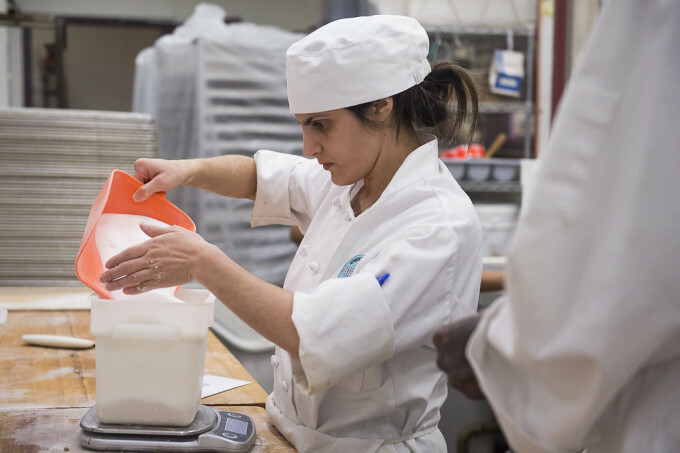 When trainees finish Hot Bread Kitchen’s program, the organization also helps find them a job. Graduates have gone on to work as bakers at Whole Foods, the fast casual chain Sweetgreen, and a number of upscale bakeries and restaurants. Since its founding in 2007, Hot Bread Kitchen has trained 83 women, 33 of whom have graduated and gone on to work in bakeries or restaurants. “One of the benefits of this program and others like it is that they are working very much within a local labor market and sort of thinking about things on the ground,” says Audrey Singer, who has researched immigrants’ employment as an immigration policy analyst at the Brookings Institution, a nonprofit think tank in D.C.
Pérez, for example, used to spend her free time making Tanta Wawa, a South American sweet bread shaped into people and animals, and traditional Ecuadorean rolls filled with cheese. Now, she works as a supervisor at Hot Bread Kitchen and runs her own catering business on the weekends.